I am wide awake and look at the clock. It is 2:50 AM. I doze fitfully until 7:00 when we all get up. I still do not feel quite right but compassion for my ailments is now gone and I am accused of faking it for the sympathy. I have decided that all the women in this family are evil. It is e-ticket night so we have decide to go to the Magic Kingdom and do some of the lesser attractions, leaving the main rides for tonight. We arrive at 9:10 and head for Fantasyland. Ariel's Grotto is closed and so Georgia must wait a while longer. We ride Pooh for the first time and enjoy it so much that we ride again straight away. It's not a groundbreaking ride but is pleasant and amusing. Tammy likes it better than Toad but then again she would enjoy the Chinese water torture better than Toad, so this cannot be regarded as much of a recommendation. We ride It's A Small World next with Tammy having to be practically carried on. The girls all like this though. I go on Dumbo for the first time. It is really only a simple fairground ride but at least it doesn't make me feel sick as rides of this type normally do. We walk back through to the hub where there is a Christmas show going on in front of the castle. I will be glad when it is finally finished and the decorations are down. The Christmas music everywhere is beginning to drive me nuts. The girls want to buy ears to wear so we stop at a cart and India chooses Mickey, while Georgia gets Piglet. There follows a discussion about Piglet's gender and, when told that he is a male, the girls decide that Georgia must be Pigletta. Hunger is setting in so we have a late breakfast/early lunch at the Plaza Restaurant. This is another first for us and is very pleasant. I eat a reasonably healthy meal for the first time on this holiday, a tuna salad sandwich, which is very good. This health kick can only go so far, so the adults share a Plaza Restaurant Sundae for dessert. Caramel, chocolate sauce, pecan and maple ice cream, nuts and whipped cream. Lovely. Into Adventureland where a Disney Vacation Club salesman gives the girls some stickers. I ask him how long the tour takes and he says about an hour. Well, as we are moving to Dixie Landings tomorrow I think it will be a good opportunity to go and do this. We book a time and he tells us that because we are staying on Disney property we will also get a free lunch afterwards. This news is greeted with great delight from Tammy - a meal and it's free! All but Tammy go into the Tiki Room. She says it is boring. Don't worry, I will grass her up to Ronnie when we meet her later in the trip. On to the Swiss Family Robinson Tree House, one of Tammy's favourites, she wants to live here. I would prefer one of the rooms above the shops opposite. What bliss waking up every morning with your own balcony overlooking Adventureland and enjoying a cup of coffee in the warm Florida sunshine. Pirates Of The Caribbean is followed by the Jungle Cruise. This is our first experience of using Fastpass and I have to say it is excellent. John is our skipper and he is very adept at delivering the corny lines with just the right amount of drollness. Tammy says her face is aching from so much smiling. We now plan to leave the park and let the girls have a swim while we relax prior to returning for e-ticket tonight. 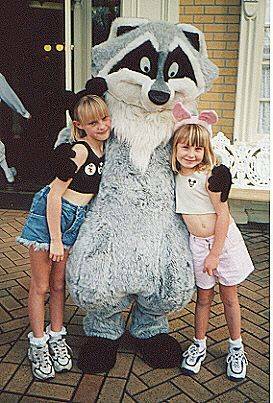 We make it as far as the Camera Centre in town square where we see Meeko. This is one of the characters that the girls have not got in their autograph books so we stop for a signature and photo. Here we encounter CM Pat, who is friendly and helpful in the extreme. She fusses over the girls and compliments them on their autograph books before giving them enough stickers to fill a small wall. Our second attempt to leave the park fails as we reach the train station. Pat comes running up the road after us to tell us that Daisy Duck is inside the Camera Centre if we would like to meet her. Another missing character from the girls books, so back we go. Pat ensures the girls are in the right place and introduces them to Daisy. After the formalities Grandma and the girls have their photo taken with Pat, who is suitably embarrassed by the whole episode. We say our goodbye's and are about to leave the park for the third time when I remember about the Guest Comments Forms in City Hall, so over we go and write out our appreciation of both Pat and Rhonda (who gave us a disposable camera on our first day.) A quick look around the art store and it is 2:55, may as well stay for the parade now. We plonk ourselves down on the curb in front of City Hall and watch it all go by. 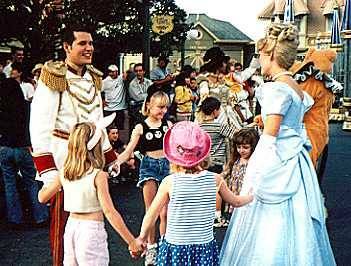 When the first float reaches us it stops and Prince Charming and Cinderella alight and invite the girls to dance with them. The girls love this and Cinderella is so pretty I am tempted to join them but a firm hand on the shoulder from Tammy suggests that this is not a good idea. Prince Charming looks like he packs a mean left hook as well, so perhaps she is right. The girls have enjoyed this enormously, like all young girls they enjoy being the centre of attention as long as it is in a way that is not too embarrassing. We finally manage to leave the Magic Kingdom at our 4th attempt around 3:50. This is a prime example of how time just disappears at WDW. One thing seems to lead on to another and before you know it the day has gone. I suppose it illustrates the case of those who say that you should go with the flow and enjoy things as they happen. Back to the All Star Movies where the girls finally get their swim while Daddy writes up his trip notes and the old women take a snooze in the room. It is slightly more cloudy and windy today but still nice and warm. We return to the Magic Kingdom at 6:00 PM and pick up our wristbands for e-ticket. The Christmas tree is lit and Main Street looks beautiful. We look in a couple of shops and then take up position in front of the hub for the 6:30 fireworks. Georgia is set to try out the earplugs that I normally wear at night. All right , you can stop laughing now, it doesn't make me any less masculine. The fireworks are as lovely as ever and the earplugs are a success, Georgia watches and there are no tears. As we walk through Frontierland on the way to Splash Mountain the country bears and a lot of dancers are heading down the street. They stop and enlist everyone around to learn how to line dance. All the women give it their best while I video the whole sorry affair. It is actually very good fun and the girls enjoy it so much that they continue dancing after everyone else is gone and they have the road to themselves. This is another small thing that sets Disney apart from all others in my opinion. There are probably more dancers than guests left in Frontierland when they start their show but all the people that are there have a real good time and leave with an enhanced feel for the Disney magic. We walk straight over to Splash Mountain. Georgia has been begging to do this for ages. Bad mistake. After the first small drop she is in tears and wants to get off. Big Thunder Mountain is next and Grandma and Georgia wait outside. It is a shame that Splash Mountain has put her off because we know that she would enjoy this but, like all small children, once she is frightened then you just have to let her come round in her own time. The Haunted Mansion is next and is great at night as always. I think that the complexity and the sheer variety of things to see is what keeps this ride one of the WDW greats. Every time I ride it I see something new. Over to Tommorowland where we ride Buzz Lightyear for the first time, swiftly followed by our second and third times. This is one great attraction. They just got it so right with this one, it is addictive. I get 90,000, 110,000, and 145,000. The next closest is India with 106,000 on her third go. My stature has increased and I walk from the exit in my best John Wayne gait, knowing I have once again saved my womenfolk from the evil alien threat and asserted my role as the dominant animal in the Stringer family pack. We leave Georgia and Grandma at the Lunching Pad and go to Space Mountain for India's first ride. She comes off beaming and wants to go straight on again. Tammy and I look at each other, think about our stomachs and decide against it. Back at the Lunching Pad Tammy sits with the girls while Grandma and I go to Alien Encounter. I have not done this for 4 years and so it is a nice change. Be advised never to take small children on this. India loves adventure and thrills but there are certain things that are best left until they are old enough to handle them, unless you want your child to have nightmares for weeks afterwards. When Grandma and I get back to the Lunching Pad India is not there. Tammy says she has gone off on her own to do Buzz again. Game little lady is India. I never had the confidence that she has at her age. Maybe this is a sign of the changing times, children do have far more self-belief than years ago. Whether this is a good thing or not I will leave up to you to decide. Georgia is very tired and has just about had enough by this time, so we start the homeward trek. We get briefly delayed at Casey's where we enjoy hotdogs and watch the closing ceremony. There is something really quite moving about the castle changing colour so beautifully while 'When You Wish Upon A Star' plays in the background. It is even better on e-ticket night when you are sat there virtually on your own. It is our own personal closing ceremony. See, I have had a wonderful day and not once did I have a beer. Bet you didn't think I could do it, did you?